The lowest 20% income quintile only has 1.7 persons per family unit while the highest quintile has 3.1 persons per family unit. In 1970, 18% of households had only one person as compared with 27% of households in 2012. In 1970 62% of women were married compared with 52% of women in 2012. Clearly each of these factors will increase income disparities between households. Another recent study, from the National Bureau of Economic Research “Is the United States Still a Land of Opportunity? 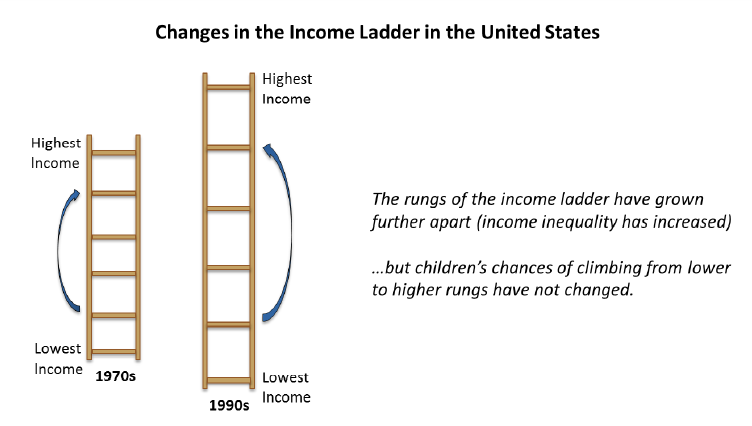 Recent Trends in Intergenerational Mobility”, concludes that, although the rungs of the income ladder have grown further apart, the chances of climbing from lower to higher rungs has not changed. 54% of all Americans say that taxes should be raised on the wealthy and corporations in order to expand programs for the poor. Only 35% believe that lowering taxes on the wealthy to encourage investment and economic growth would be a better approach. Unfavorable opinions of the Tea Party have increased from 25% in 2010 to 49% today. The public has more confidence in Democrat’s handling of healthcare by a 45% to 37% margin. Just 42% to 38% favor Republicans in handling the economy. My conclusion from all of this data is that fiscal conservatives need to do a much better job of showing sympathy and concern for those who are struggling at the lower ends of the income scale. Success in implementing the sound policies which are needed to turn things around depends on accomplishing this! This entry was posted in income inequality, income ladder, inequality, Jack Heidel, Manhattan Institute, mobility, NBER, Pew Research Center, public perceptions, Uncategorized, wealth inequality and tagged economic growth, Economic inequality, economic mobility, income ladder, inequality, jack heidel, mobility by jackheidel. Bookmark the permalink.